Billabongs – Boabs – Bush - BarrierReef and Beyond…. Sitting on the Broome and Red Centre wall. Flying colours around the space..
An installation of artworks reflecting the painted diary of my travels from 1994….to now….. This Art installation is my collaboration with Margot Gordon to celebrate Shinto Shiatsu in a unique and colourful environment. To quote Margot…..“On the beautiful Great Barrier Reef you can have the most fantastic massage therapy of your life! Like you've never had before! The most seasoned , well travelled amongst you will find this massage approach new, inspiring and above all, delightful . 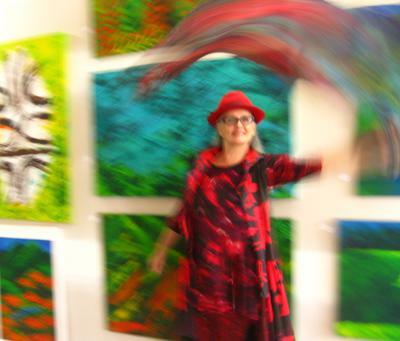 I have just spent 2 weeks at my old haunt, Cooya Beach near Port Douglas, to work with Margot on the new Shiatsu Tent…the huge room in Port has been open for several months and Margot filled the walls with my paintings and the scrolls and cloths were draped over the tent. The space has been now been transformed into a Zen style room……. The Indigo Shiatsu Tent is a meditative space… the Indigo dyed curtains reflecting both the midnight sky and the deep blue sea at the edge of our colourful local reef….….the floor is covered with an ocean blue futon… to relax on and enjoy the benefits of Margot’s Japanese inspired massage, while surrounded by the colours of OZ…a peaceful and serene place of Beauty……. Margot’s massage is amazing and one feels deeply relaxed. The past 40 years have taken me around Australia on wanderings through the outback of Oz…discovering and documenting the amazing landscape in a myriad of ways, revealing a colourful and unique passion for telling the stories of my travels. 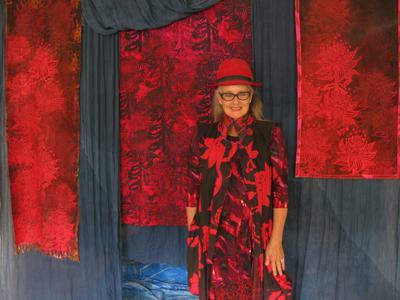 It was after journeys to Central Australia and Lightning Ridge that I launched my Bush Couture studio and concept in 1982, bringing the bush to town in a new Art form. I experimented with unorthodox ways of printing and making cloth, by exploiting techniques of mark making, monoprint and painting. 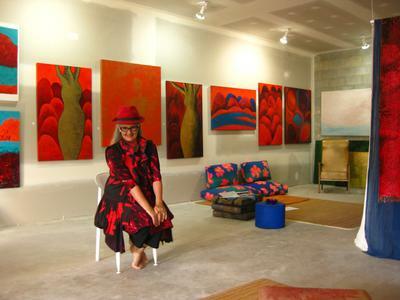 When I closed my studio in Sydney in 1992 I relocated to Arnhem Land in the Northern Territory and for the next 20 years lived and worked in many remote country towns and Indigenous communities. 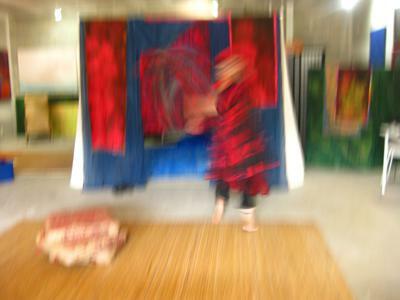 I continued painting and creating Art and Textiles with over 20 solo exhibitions and installations. The paintings and scrolls in the Shinto Shiatsu interior reflect the days in Alice Springs, the drive to Broome and back, the Blue Mountains…and the walkabout through the rainforest, reef and rivers of the Tropics. Inspired by the Romance of the Swag and other Australian tales…and the magnificence of the landscape…..the bush has always had a magnetism I could not ignore… this work symbolizes a journey from one side of Oz to the other…Sunrise to Sunset… with some full moons and eclipses in between… a journey that is geographical, aesthetic, and experiential…and which includes icons and colours of the different destinations. The fabulous flying photos courtesy of Jill Booth...my favourite pics of the day in the space !! Comments for Billabongs – Boabs – Bush - BarrierReef and Beyond…. The colours are brilliant indeed! What an inspiration to be surrounded by them as you work.